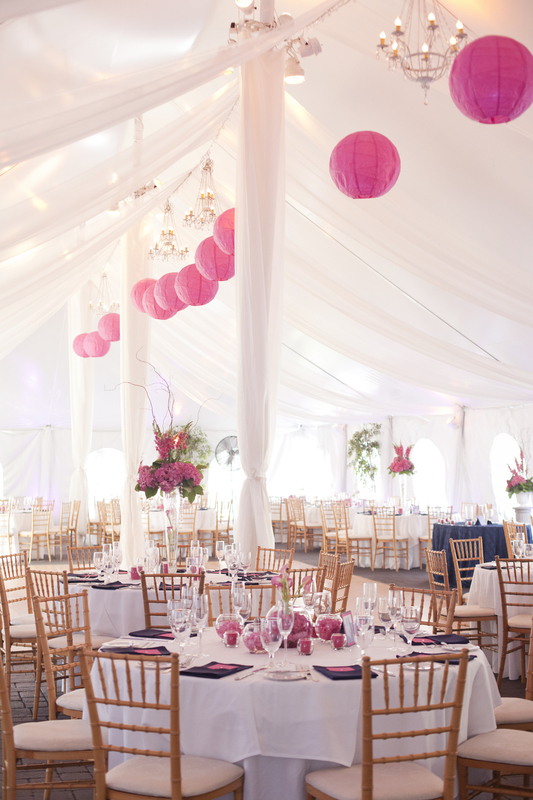 A light and airy reception tent waits for guests to have dinner and dance the night away! It's been a cold, snowy and LONG winter here in the Boston area this year. I was thinking about some of the warmest days that people have gotten married on and Kristin and Kevin's July wedding came right to the front of my mind. 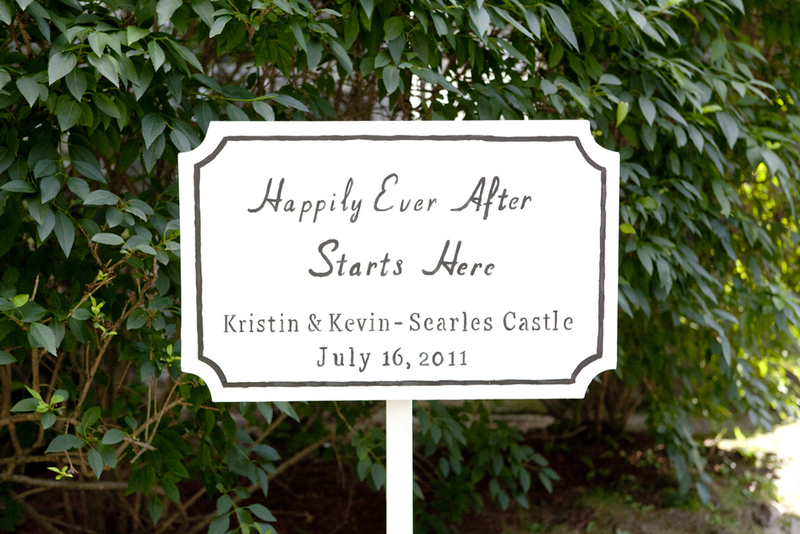 Their wedding was at Searles Castle in Windham, New Hampshire. 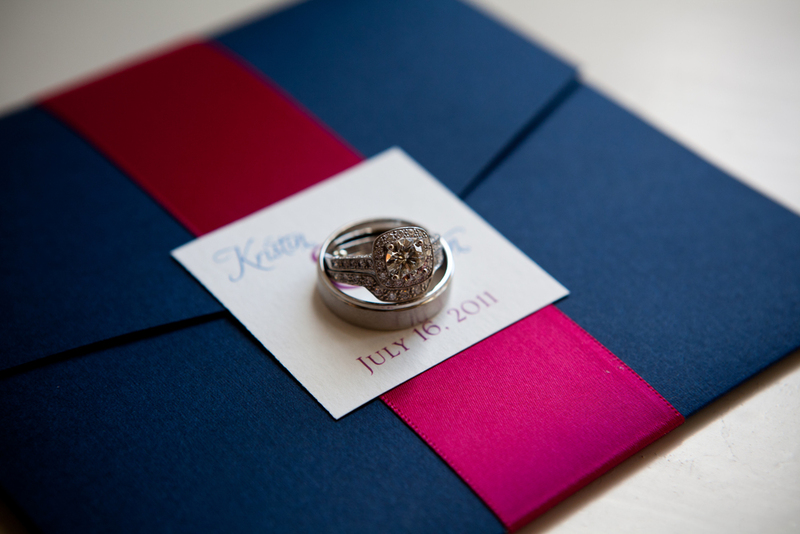 The color palette of navy and fuchsia worked so well at the Castle and we had so much fun designing her beautiful invitations and paper goods. I should also note that Kristin's father created the awesome signs for the wedding. Kristin's mom was so much fun to work with as well and we all just had a great time. It does show you that with careful planning and organization, you can have a lot of fun before the wedding as well! There were so many wonderful details from this wedding but I think my favorite was the bride and her beautiful dress, aka Billie. The best accesory a bride can work is her smile and love for her future husband. And on this day, Kristin really shined liked a diamond. 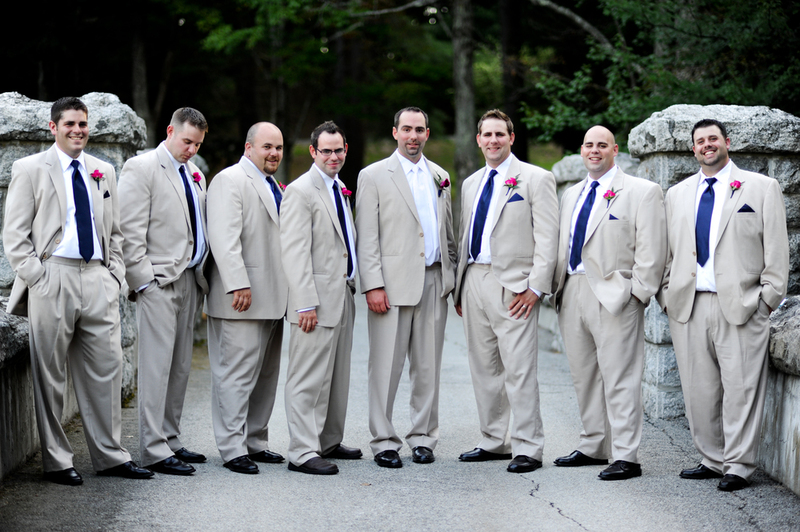 To see more pictures, visit Kristin and Kevin's Slideshow on our website. We loved the low pink centerpieces and our signature square photo table numbers! Cocktail hour was outside and in the castle. One of the wedding signs designed by the Bride's father. A customized poster "guest book" with our signature ribbon pens. High Centerpieces featuring snapdragons, curly willow and hydrangea. Navy bengaline napkins and fuchsia menu cards finish the reception tables with a pop of color. Little lockets holding photos of dear grandparents attending in spirit. 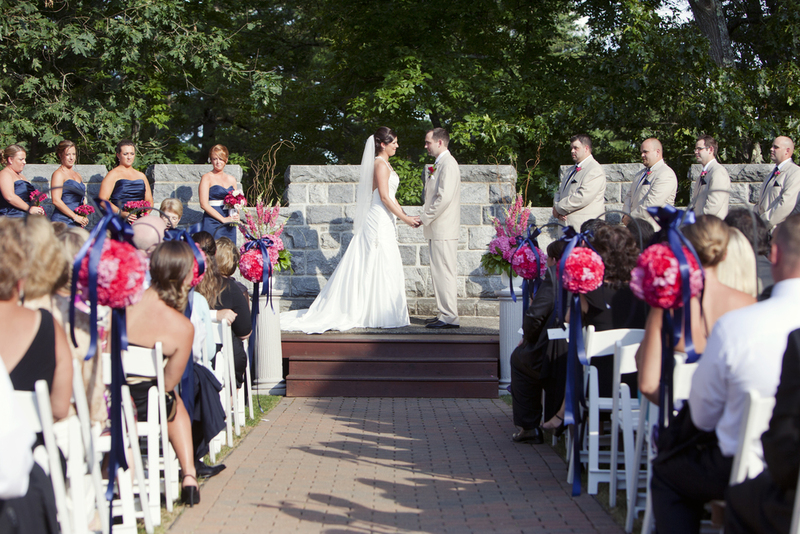 How smart was the bride to want a ceremony program that doubled as a fan! Loved the fuchsia shoes on the lovely bridesmaids! Exchanging vows at the ceremony. A first dance in the beautiful tent. A great directional sign created by the Father of the Bride. Dear Donna: What do I put in a Welcome Bag for my out-of-town wedding guests?